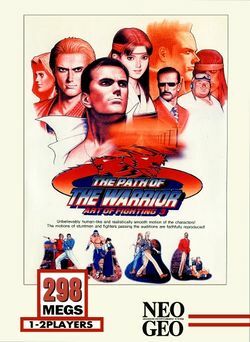 Art of Fighting 3: The Path of the Warrior was released in 1996. It used a 'spirit' system similar to its predecessors and featured a completely new cast of characters with the exception of Ryo and Robert. The story switched focus from the Sakazakis to Robert Garcia. Garcia disappears to search for an old childhood friend, Freia Lawrence, and he tracks her to GlassHill, Mexico. Freia is wanted by the game's boss character, Wyler, to complete a powerful elixir that was created by his and Freia's fathers. The drug affects users in a similar manner as the potion in The Strange Case of Dr. Jekyll and Mr. Hyde. One of the game's characters, Kasumi Todoh, became a part of the King of Fighters cast. The Neo Geo version of this game does not contain a intro dialog for each fight, nor does the Arcade or the Art of Fighting Anthology version for the PlayStation 2. The only (complete) version that has those cinematics is the version for the Neo Geo CD system. This page was last edited on 10 February 2018, at 06:14.